Upon arrival home from the Caribbean, we had a lot of pictures to sort through. One of my favorites, was of my brother and I sharing a moment over a bonefish. My mother had kindly saved a coupon to order one of those awesome canvas prints for my birthday. Naturally, I chose the picture of my brother and I. When it arrived, I was blown away at the quality of the images replication. From afar, it looks like a blown up photograph but upon closer inspection it has the look and feel of a fine painting. A bonus, the image is three dimensional and wraps around the canvas. About a month later, I was contacted by Easy Canvas Prints, with an offer for a review of sorts on TRIW. Since I already knew of the quality offered, I accepted. It also helped, that my father's birthday was around the corner, and I had an idea. A little over a year ago, I landed the largest carp I have ever hooked, while my father was present. The only words I could utter, were "dad, I've got a big fish". 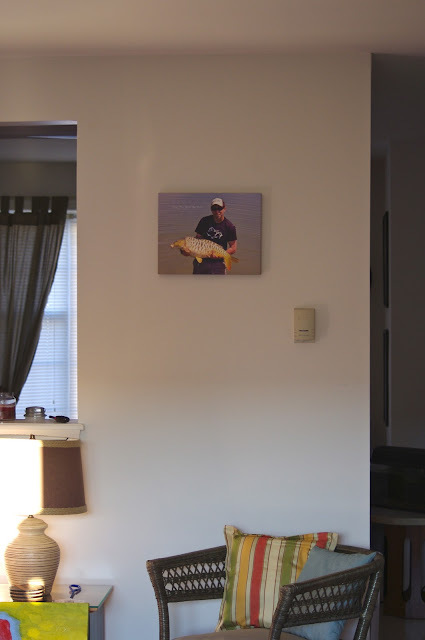 The canvas print became a chance to forever immortalize that moment between my father and I. As the name suggests, the entire process is incredibly easy. One simply uploads the photo of their choice, chooses the correct size (lots to choose from! ), as well as the thickness and style of the wrap around effect. If you are unsure of the style you would like, the ordering process allows you to see what the projected product will look like and even places it to scale against a backdrop of furniture. Less than a week later, I was handing the finished (ready to mount) product to a proud father. In a sport where catch and release is paramount, canvas prints offer a fine opportunity for preserving those fine moments on the water, without breaking the bank. Easy Canvas Prints is a perfect way to put your photos to canvas. Check them out! As a bonus deal, if you "like" them on Facebook you have an opportunity for free shipping and 50% off your next offer. I like the one with the bonefish. That turned out pretty nice.